Previously almost nonexistent good and efficient products for oily skin, It was only more products for dry skin even here in brasileiras.Mas stores over time this changed, and cosmetics companies have brought more innovation in their products for skin oleosa.Atualmente have products for this skin type with anti-idade.Vou could tell you that super review about this product Roc glycolic 8.0 or more commonly known as Oil Control Glycolic 8.0 Yes brand Roc, I tested on my skin. But they asked me so:”But Babis you are over 40 years of age and your skin is still oily? While my skin oily I will continue to use some products for oily skin yes. But back to this product Roc brand, I bought this product Roc in a pharmacy of my city to experience in my pele.E kept thinking before is that this product is good?Did I'll like the product? 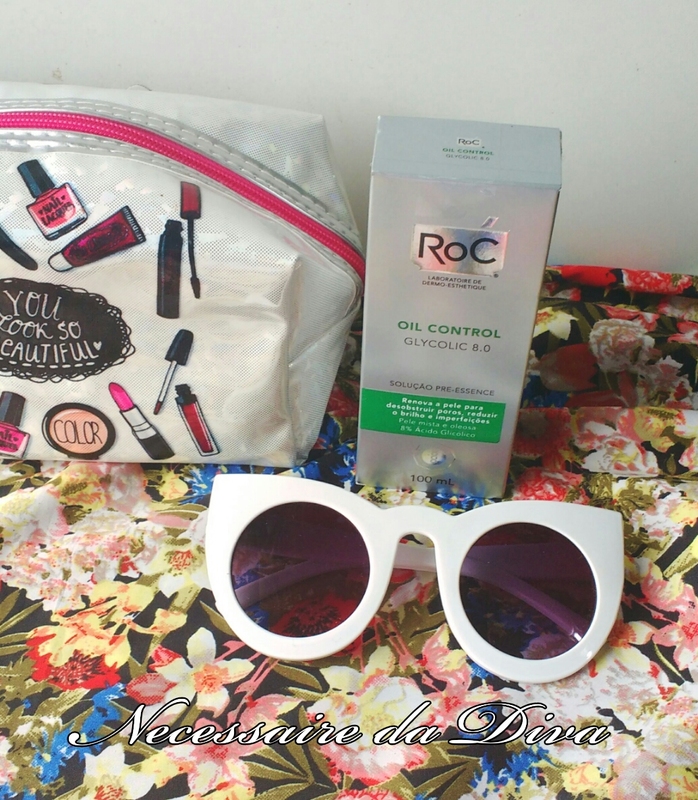 Review of Roc Glycolic 8.0- skin type and product features. 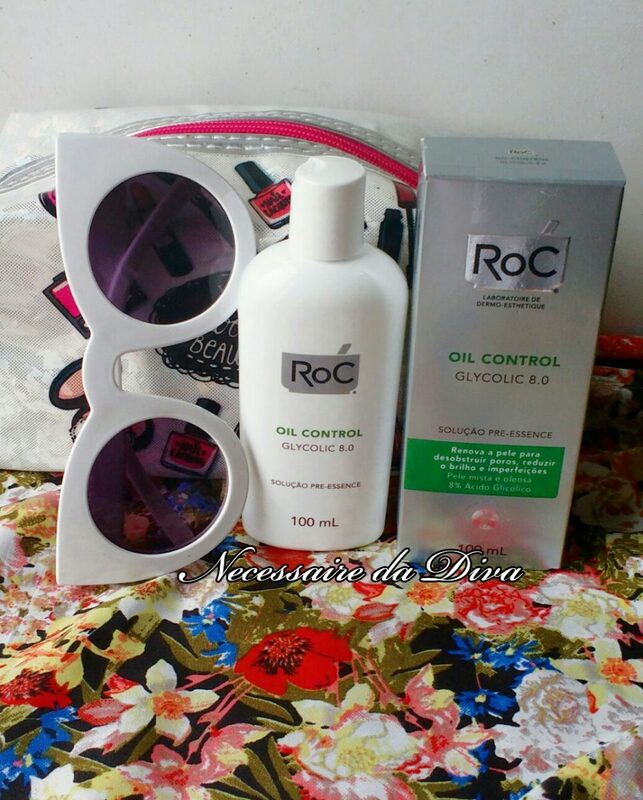 Roc Oil Control Glycolic 8.0 It comes in a plastic bottle 100 ml and has a transparent color and a stench. Um liquid is transparent and up, that flows very easily. In its composition has 8% glycolic acid, and should not be applied to irritated or damaged skin. This product is designed for combination skin or oleosas.E according to the manufacturer of the product: “ROC® Oil Control Glycolic 8.0 It is a refreshing solution for daily use that reduces oiliness, pairs, brands, fine lines and improves skin texture. With high concentration of Glycolic Acid, active dermatological efficacy observed with, the product promotes the reduction of the imperfections present in oily skin with signs of age. Generally mameira the product exfoliates the skin leaving it more renewed and more jovem.Tendo an act against wrinkles and fine lines as well. And good will that all people with their small signs of aging may have a specific product for this type of skin, good and without leaving it too oily? Anyway for younger and older people like me, we really need a product like this. In packaging the ingredients of this product are in inglês.E remembering that this product has 8% of glycolic acid in the composition, and may not be used in people with allergies to this product. Ingredients: Aqua,Denat, Glycolic acid,Propylene glycol,Polyquartenium-10, Tetrasodium EDTA,Polysorbate 20, Chlorhexidine digluconate. Roc Oil Control product line. After all what are the products that line the Roc for oily or combination skin? Oil Control Intensive Cleanser- Cleansing Gel. Oil Control Age & Corrector -anti-age mattifying. Glycolic 8.0- daily glycolic acid solution. Serum antioxidant Minesol solar-protective and anti-aging. As I tested this product? I performed two different tests,test is a test n.1 n.2, with the same product, to observe the effectiveness of the product and also the ideal way to use my pele.Usei a cotton swab to apply this product in a circular motion on the face, instead of applying the product directly on the fingers as recommended by the manufacturer. You may want to test the product and see which way the product is best suited to your skin or lifestyle. Roc All these products are not very baratinhos not, then not used with the soap that line, but with the other brand for oily skin. Nesse teste n.1 lavei o meu rosto com o sabonete e depois apliquei esse produto com um pequeno pedaço de algodão,as I found far better to use a piece of cotton than the fingertips. Spent cotton with a circular motion and the cotton is observed a little dirty. This sunscreen is excellent and the best for oily skin in my opinion. Detail used the product morning and night as recommended by the fabricante.Resumindo used only two products of this line Roc Oil Control. If your skin does not need an anti-aging cream with firming effect( to firm up sagging skin of the face), then use only the Roc brand products or other your favorite, because your skin does not need that kind of product firming effect. 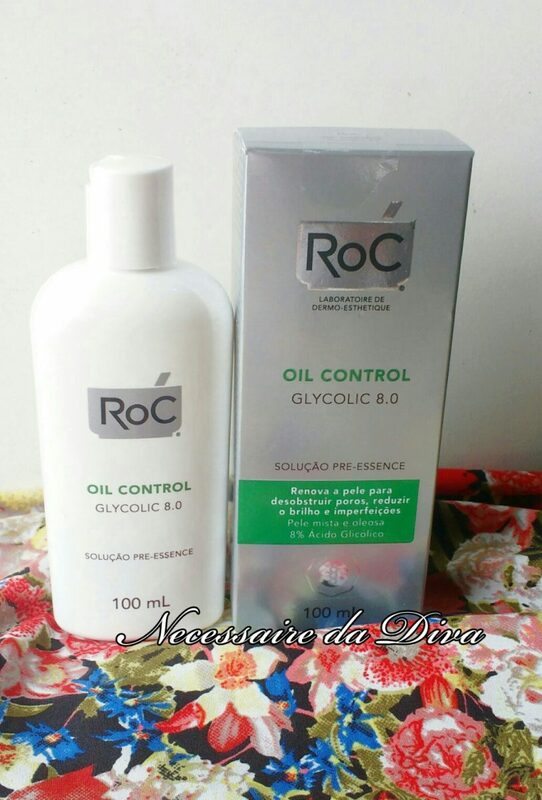 I am currently using products with the Roc Glycolic 8.0 in my skin. In this test n.2 I washed my face with a soap other brand, and only used the product once a day, applying only in the period of manhã.Passei my anti-aging cream on the face( except in the oilier T area face) and finished with sunscreen Minesol Roc Oil Control of Roc 30.E factor worth remembering that this sunscreen that line it has an absorption effect of the oil of facial skin,making it more matte and without oleosidade.Bem this nifty effect of sunscreen Roc. I found two ways to use this product, during the day and night. About n.1 test, percebi que a minha pele ficou oleosa e com um pouco de brilho depois de duas horas.Talvez se eu tivesse lavado com o sabonete dessa linha acredito que a pele não estaria brilhando depois de duas horas,for facial cleansing soap Roc is wonderful and leaves the skin well sequinha. And others say that this product leaves no oily skin,They used the line that cleaning soap Roc. The test n.1 left my skin more oily after two hours, and in it I used the product morning and will noite.Sinceramente not like the result of oiliness, but only the skin effect more jovem.A my skin was smoother and more jovem.Um powerful anti-aging effect!! But the test n.2 worked better on my skin, where the skin was not oily after two hours or more. Good but the product was shiny on my skin, of course it could also be applied to dry skin also. 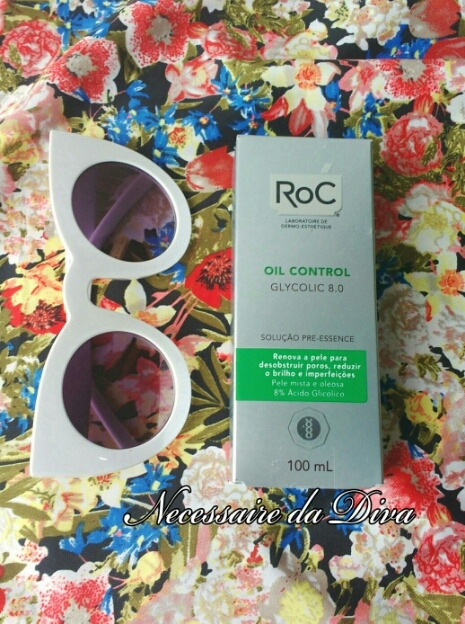 And if you do not want a skin glow,the secret is to use the other products in this line Roc Oil Control, as the soap that linha.A skin was completely renewed, jovem como no teste n.1.Amei esse efeito anti-idade desse produto,fabulous!! Even the anti-aging cream that applied had better absorption with glycolic acid Glycolic Roc 8.0, and my skin was firm and also young. As to the question skin whitening, I can say that the product has a slow effect and gradual,this is, do not expect a full whitening as a facial peeling. As sunspots on my skin saw a very slow clearance and light. But overall the result was surprising even, and I enjoyed the product using the test n.2. 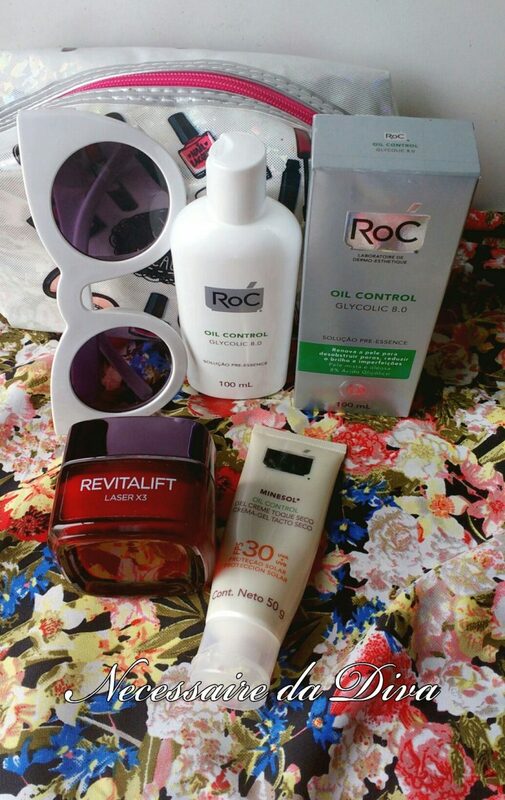 The power glycolic acid is fabulous,and congratulations to Roc brand the product,because loved the product. A more beautiful skin,renewed and younger was all I procurava.E for younger people 30 years I plan to soon publish a post with tips to make the skin more beautiful soon, wait. And if you have between 20 a 30 years old I advise you to invest in Roc brand of quality products, and thus prevent premature aging of your skin and not get an ugly skin and all full of depois.Invista wrinkles on your skin while you can. I believe this product can also be used on dry skin for the purpose of renovation / skin exfoliation, because glycolic acid leaves skin a little hydrated and shiny, in my opinion if you do not apply a product to absorb skin oils, as sunscreen Minesol Oil Control of Roc. The product costs on average 99,90 real and worth much, it is wonderful!!! The anti-oily skin effect may vary according to the type of product you will use and works even if you use the complementary products that line facial.Usar this product alone does not really work, you must use at least the sunscreen Minesol Oil Control. Already the effects against skin aging and skin renewal are fantastic with this product and I enjoyed. I over 40 years have thousands of fantastic tips for you that my blog, and I'm always looking for high quality products such as the Roc brand for example. Enjoy this article?So leave your comment that my article and share this post também.Siga the Necessaire Diva blog on social networks and also push.Um super kiss notification!! (Updated 17/4/19- Tests with 1 e 2 observed). Previous PostPrevious Men err in photographs: perfect pictures tips to put the Tinder. Next PostNext Vlog: release of the video Roc Glycolic 8.0 review. Powerful bubbles masks for face. I tested the matte base and the primer of Ruby Rose.